Rio Grande Valley FC Toros' midfielder Matías Zaldívar (7) and LA Galaxy II's midfielder Geoffrey Acheampong (44) battle for the ball during a United Soccer League season game at H-E-B Park on Wednesday, May 23, 2018 in Rio Grande City. EDINBURG — Reviewing the film of last week’s match against Saint Louis FC, RGV FC coach Gerson Echeverry saw a familiar script. He said the Toros played well and controlled the match, but they never found a goal. The 0-0 draw marked the seventh scoreless outing in the past 10 matches for RGV FC, which has converted just 14 goals in 16 games this year to rank tied for last in the USL in scoring. As the match against Saint Louis wore on, Echeverry saw “naïve” play from the Toros. He said his side wasn’t combining as well as it needed to in the offensive third, with some players keeping their heads down rather than looking for a teammate. Those tendencies have been a point of emphasis this week with RGV FC’s primary offensive weapons — a group that includes Aldo Quintanilla, Matias Zaldivar and Jesus Enriquez. The scoring struggles have resulted in a significant slump for RGV FC, which sits 1-6-9 on the year and is winless for a franchise-record 10 straight matches dating back to April 25. The Toros’ next match seems to be as good a chance as any to end the slide, as RGV FC hosts Tulsa Roughnecks FC at 7:30 p.m. Saturday in H-E-B Park. Tulsa is just 1-8-8 on the year and has conceded 36 goals — the most of any team in the Western Conference. Echeverry said his offense displays the talent to generate goals in training, but he questions whether those attackers have the ability to produce under the pressure of having fans in the stands for a regulation match. Zaldivar ranks atop the Toros in both shots (21) and crosses (42), but he’s created just one goal and no assists this season. He admits that he’s “felt bad about the results” RGV FC has endured this year, but he said the Toros are continuing to practice with the same intensity in hopes of turning their season around. Echeverry credited Zaldivar for being a strong two-way player, as the midfielder also leads the team with 53 tackles — 17 more than second-ranked Todd Wharton. Zaldivar has in recent weeks become RGV’s go-to option on corners and set pieces, but Echeverry said he’d like to see Zaldivar make more of those opportunities. Likewise, Echeverry said Zaldivar is one of many players who needs to do more with his final touch, be it a pass or a shot. The 22-year-old Zaldivar said he’d one day like to return to his home country of Argentina to play professionally. He began his pro career with Argentina’s Arsenal de Sarandi, debuting on May 14, 2014. He said a knee injury suffered about a month later kept him off the field for a year, and he played only sparingly with the club before his contract expired after the 2017 season. 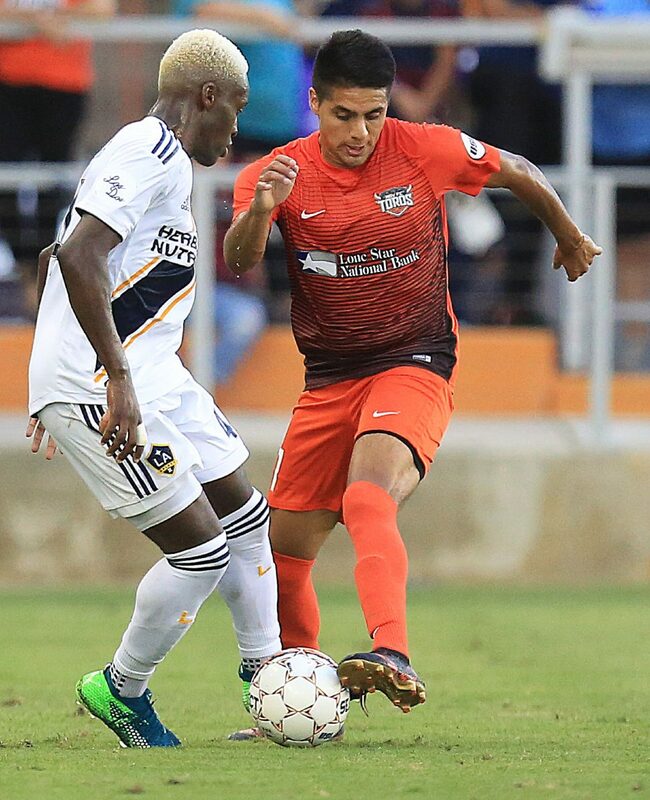 His agent helped him land a tryout with RGV FC, and last month he netted a goal for the Houston Dynamo after being signed on a short-term contract to play in the team’s U.S. Open Cup match against the NTX Rayados. Looking forward, Zaldivar knows what he has to do to both reach his individual goals and push the Toros back into the win column.